Everyone could use a little more time in their day to focus on what they care about. Time blocking is the practice of scheduling out everything in your entire day, including meals, work projects and personal time in order to better manage time and discover where precious hours are either being wasted or underutilized. The Road Warrior blog credits Cal Newport with the idea with his article back in 2013, but of course, this productivity method has surely been used before then. In this article, we go over the dos and don’ts of time blocking, how it has worked for some people and how it can make you productive at home and at work. As mentioned, time blocking (sometimes called calendar blocking) works when your entire day is scheduled. While this can seem too constraining to some people, it actually helps you get more done, so you have more free time to do the things you enjoy. After all, when you get everything done that you need to in any given day, you feel less anxious and stressed after work in the evenings. How people block their days varies depending on their needs, but the beauty of time blocking is that it can work for anyone, from a stay-at-home mom to a busy business owner. The only thing that varies is what their blocks contain. The first thing that needs to be blocked off in a calendar is the actual work day. 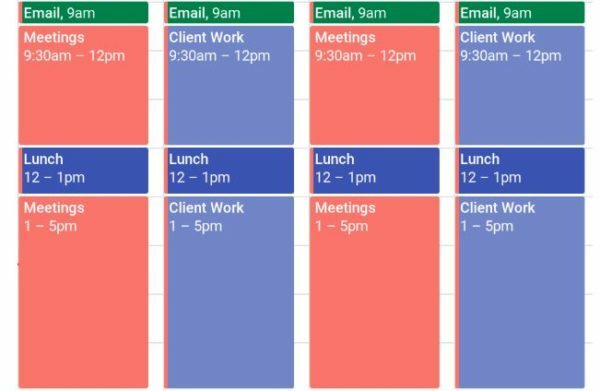 This will give you a good bird’s eye view of when you’ll be able to fit in meetings and projects. Your work day is the time of day that you actually spend at your desk, so exclude your commute and your lunch break. For many people, that’s an eight or nine hour day, Monday through Friday, likely from 8:00 am to 5:00 pm or 9:00 am to 6:00 pm. Using that metric, we can see that we have about forty hours blocked per week for work. From there, we can further segment this time into designated chunks. For someone who is a full-time parent or isn’t working a traditional job, these hours can be designated for times you do the same things at the same time every day or week, like school drop-offs or trips to the post office, for example. Start filling in your workday with designated times for meetings and creative work. For someone in a creative field, this is especially important, as having meetings at random times throughout the week can throw off creative focus. If possible, designate one or two days a week as “meeting days.” Try to always have your standing meetings during these days, and ask others you usually meet with to move regular meetings to these days as well. Because you are only trying to meet on these designated days, make sure you are completely flexible about the time of day these meetings occur. The other days of the week can be assigned as creative time or actual work time. For many professionals, these are the hours where the actual work is done. Meetings, on the other hand, are usually more of an administrative task unless your profession is something like project management or sales. If you have standing clients, one possibility is to assign each client a specific day or window that you work solely on their projects. This works well if you have a set amount of work each week that doesn’t require daily check-ins. For example, running a weekly report or writing an article would be projects that could be assigned to specific days. Otherwise, if your work varies each week, simply segment your work days into creative blocks. Usually, this is broken up by lunch, but be sure to schedule in breaks if you always take one. Besides the work day, it’s also important to block off your personal time. If you don’t do something specific every week, then just block it off as “personal time.” However, you can break it down even further by thinking about what you do every evening after work. Most people walk their dogs, cook and eat dinner, workout, spend time with their spouse and kids, etc. Be sure to also look at what you’re doing before work: this can be time blocked as well. Showering, blow drying hair, exercising, and other daily activities can all be scheduled before the work day begins. 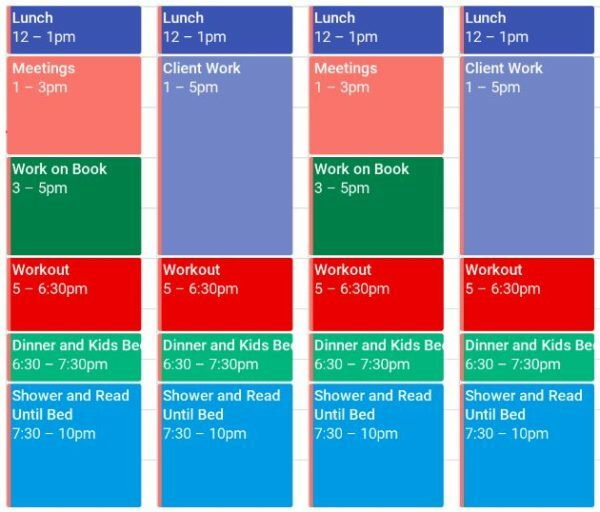 Once you map out your work and personal activities, you can see your ideal day. This helps you further refine your schedule to build in more of what you want. It’s possible to work in any additional goals that you have if you designate a time for it. After taking a look at your blocked calendar, look at where you can feasibly fit in 30-60 minutes to work on a goal of yours. This might be to exercise more or to make dinner at home five nights a week. If they are scheduled in your calendar, you are much more likely to get them done. On the meeting days, you might realize that you won’t have enough meetings each week that would take up the 13-16 hours a week that you’ve set aside for it. This means that you might be able to use some of this time on meetings days to work toward a goal. Setting aside time for what you want to work on can give you the permission you’ve been waiting for to really put effort into it. It’s easy to be unable to see how we can fit in additional projects when our regular week seems so full. However, by scheduling everything out, you are better able to see how the puzzle pieces of a schedule fit together to make everything work. In addition to blocking time for your regular work, like email or meetings, you can also block for things you do every day that you don’t realize are really taking up time. This includes showering, getting ready in the morning, and your daily commute. By accounting for these things, you can see where your workday actually begins and when it should end (depending on what you want to do in the evenings). When you account for drive time, you might realize that you actually need to start going into work earlier or ending your workday sooner so you can fit it all in. 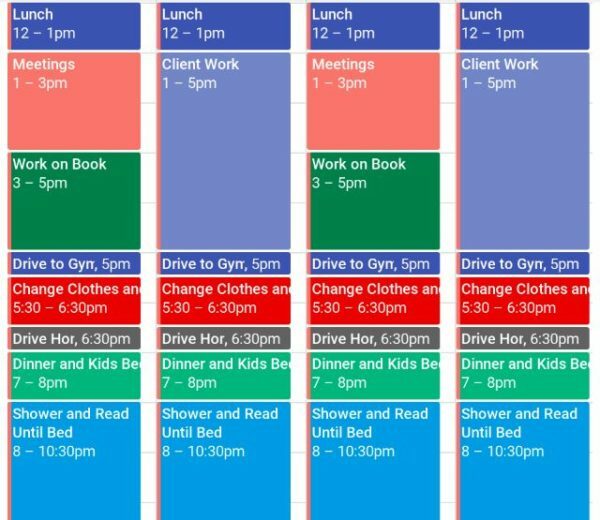 For example, in the sample calendar above, when we account for commuting to and from the gym, we see that dinner and the kids’ bedtime is pushed to 7:00-8:00 pm. If we know the kids always go to bed at 7:30, and 8:00 pm would be too late, so we need to figure out how to either leave work earlier, make our workout shorter, or change when we do our workout to make sure everything fits. You can also account for how much time you’ll have in the evenings by counting backward from the morning to how many hours of sleep you need. For instance, if you always wake up at 6:30 am and you need eight hours of sleep at night, then bedtime should be around 10 or 10:30 pm each night. Time blocking may seem overwhelming at first, but it’s actually a time management strategy that gives you a lot of freedom to see where you have pockets of time to work on your goals and where you need to reframe your working or personal hours. Even if you don’t leave your time blocks as a permanent addition to your calendar, this can be an interesting exercise to learn where your time is really going each day. If you’re looking for ways to manage time, ProjectManager.com has the tools you need to work more efficiently. Our cloud-based project management software gives you real time data to track your progress during the day and an online Gantt chart with which you can uses to link tasks and share your schedule with others. And that’s just the start of our feature set. Check out what ProjectManager.com can do for you by taking this free 30-day trial.